On top of the shear panic unleashed by the spread of the Ebola virus from West Africa, an astonishing amount of ignorance has reared its ugly head. As some have commented, this ignorance may be more dangerous to millions of people than the actual virus, and the unfamiliarity could even make matters worse, by focusing our concerns in the wrong direction, and isolating people and places from technology, education, and healthcare. When my family was getting ready to live in West Africa a few years ago, it felt like everyone would ask us about the animals -- but that part of Africa has virtually no exotic animals roaming around and "it's not the Lion King set!" as my then-11-year-old daughter would exclaim in exasperation. The other common reaction revolved around the astonishment that we were going to "Africa, Africa?!" "It's so far away." "I can't imagine ever going there." Or "That's my lifelong dream to go there" (often followed by a sigh that it would never happen). In reality, people are going back and forth all the time, making the continents feel like they are closer together, and seven of the ten fastest growing economies in the world this year are in Africa. Yet popular media rarely cover that story, and instead often reinforce the pity and ignorance, from infamous pronouncements that "these countries they do not believe in traditional medical care..." (Actually, as many kids aren't vaccinated in wealthy pockets of Los Angeles as in South Sudan or Chad, among the poorest, most war-torn countries in Africa.) And a virtual army of emergency workers and law enforcement greeted a plane landing in LA from NY after learning a woman coming from "Africa" had been vomiting on the flight -- in reality she had air sickness (and a history of air sickness), and came from South Africa. But did you know: Johannesburg is farther away from Freetown, Sierra Leone than Dallas is from Lima, Peru, in the middle of South America. Ignorance on such a basic level as each of these examples feeds prejudice, hurts economies that are actually rebounding from their own difficulties (e.g., bookings for safaris in East Africa are way down, let alone a standstill in West Africa's commerce and investment), and can fuel fanaticism by preventing personal relationships and trust from forming, not to mention the commentary on our global and geographic illiteracy. This is all the more frustrating since this type of ignorance literally could be stamped out by kindergarten. Go beyond the animals and the tragedy. It's common for U.S. schools to teach about Africa through "safari" animals. This could turn into a valuable lesson on biodiversity and protecting their environment, but wildlife in Africa shouldn't be the sole focus of a study on culture or a continent. Other times, children hear about poverty or disease, like the AIDS crisis and now Ebola, which exist in some regions but do not define an immensely diverse continent. Fight the urge to refer to "Africa" as a country or single entity. Did you know Africa has over 2,000 languages and many more ethnic groups, in its 54 countries? 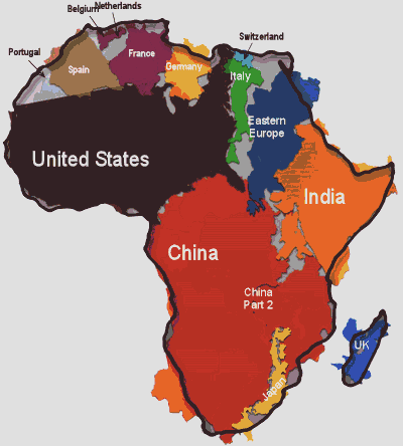 So, when teaching about the region or a specific country, be careful not to generalize information and refer to "Africa" unless you are consciously referring to the continent. Source: Kai Krause, "The True Size of Africa"
Dispel stereotypes by teaching a variety of stories from different countries in the continent. One book that counters stereotypes, "Africa is Not a Country" by Margy Burns Knight and Anne Sibley O'Brien, gets to the heart of modern Africa: rural and urban families, living contemporary and traditional lives, and the children in their homes, enjoying their families, going to school, and playing with their friends. As an introductory activity (the book touches on 25 out of the 54 countries in Africa), kids can listen to the book and then can locate and color individual countries on a printable map of Africa as they hear them mentioned in the story; then when they really learn the geography, they can color blank maps. (Here's a resource for labeled and blank maps of continents and regions). The entire activity is explained here on this Kid World Citizen page here. Choose a specific country and dive deep. Look for books that showcase rural and urban kids, fiction and nonfiction stories, folk tales, biographies, history, and stories on innovation. For example, this list helps children explore many aspects of South Africa through appropriate children's literature, and the Global Education Toolkit's multicultural book list has dozens more. Use Google Earth streetview to take a "walking tour" of major cities, national parks, and landforms. Find some major festivals and talk about the values and traditions that are celebrated, and for higher grades, look at the role of religion. Tie in lessons to your curriculum: if you are studying biographies, read Nelson Mandela's abridged biography for kids, or learn about the other TEN Nobel Prize winners from South Africa. Other important biographies can include Nobel Peace Prize winners like Wangari Maathai (Kenya), Kofi Annan (Ghana) and Leymah Gbowee (Liberia) or Nobel Literature laureates like Wole Soyinka (Nigeria) and Naguib Mahfouz (Egypt). Apartheid and various nations' independence movements can illuminate a study of Civil Rights. Science classes can look at poaching of the rhinos, desertification, water resource challenges, alternatives to the electric grid in the United States, or compare National Parks in various countries. Make it personal. When kids feel a personal connection to a place, ideally through a friendship or someone's life they connect to through blogs, stories, social media, art, music, food, and sports, then empathy, compassion, and respect can build. It starts to feel silly to generalize a whole continent when your friend, favorite team, or artist is Nigerian or Gambian, Tanzanian or Congolese. Thanks to digital technologies, it's never been easier to connect to real people and make friends. What are some of your favorite ways to dispel myths about Africa? Do you have a favorite book, resource, recipe, or song to recommend? For more terrific global education resources, tune in November 17-21 for the Global Education Conference, completely online and free to all. If you miss a session, like Homa Tavangar's keynote, all sessions will be archived. The suggestions in this piece are derived from The Global Education Toolkit for Elementary Learners, which includes many more ideas for lesson planning, technology integration, classroom and school-wide projects, parent engagement and service-learning.